The core API supports each piece of functionality, with convenience methods that build on top and can be called in the context of notebooks. TFDV can compute descriptive statistics that provide a quick overview of the data in terms of the features that are present and the shapes of their value distributions. Tools such as Facets Overview can provide a succinct visualization of these statistics for easy browsing. The previous example assumes that the data is stored in a TFRecord file. TFDV also supports CSV input format, with extensibility for other common formats. You can find the available data decoders here. Internally, TFDV uses Apache Beam's data-parallel processing framework to scale the computation of statistics over large datasets. For applications that wish to integrate deeper with TFDV (e.g. attach statistics generation at the end of a data-generation pipeline, generate statistics for data in custom format), the API also exposes a Beam PTransform for statistics generation. # Create and set your PipelineOptions. # staging location, temp_location and specify DataflowRunner. # PATH_TO_WHL_FILE should point to the downloaded tfdv wheel file. In this case, the generated statistics proto is stored in a TFRecord file written to GCS_STATS_OUTPUT_PATH. the expected domains of features. In short, the schema describes the expectations for "correct" data and can thus be used to detect errors in the data (described below). Moreover, the same schema can be used to set up Tensorflow Transform for data transformations. Note that the schema is expected to be fairly static, e.g., several datasets can conform to the same schema, whereas statistics (described above) can vary per dataset. In general, TFDV uses conservative heuristics to infer stable data properties from the statistics in order to avoid overfitting the schema to the specific dataset. It is strongly advised to review the inferred schema and refine it as needed, to capture any domain knowledge about the data that TFDV's heuristics might have missed. 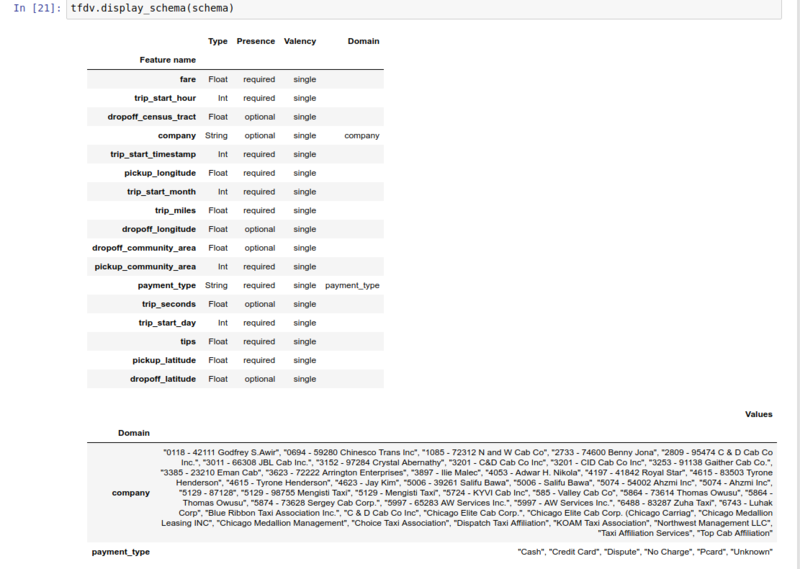 The example notebook contains a simple visualization of the schema as a table, listing each feature and its main characteristics as encoded in the schema. The result is an instance of the Anomalies protocol buffer and describes any errors where the statistics do not agree with the schema. For example, suppose that the data at other_path contains examples with values for the feature payment_type outside the domain specified in the schema. payment_type  Unexpected string values  Examples contain values missing from the schema: Prcard (<1%). indicating that an out of domain value was found in the stats in < 1% of the feature values. If the anomaly truly indicates a data error, then the underlying data should be fixed before using it for training. The various anomaly types that can be detected by this module are listed here. The example notebook contains a simple visualization of the anomalies as a table, listing the features where errors are detected and a short description of each error. By default, validations assume that all datasets in a pipeline adhere to a single schema. In some cases introducing slight schema variations is necessary, for instance features used as labels are required during training (and should be validated), but are missing during serving. Environments can be used to express such requirements. In particular, features in schema can be associated with a set of environments using default_environment, in_environment and not_in_environment. For example, if the tips feature is being used as the label in training, but missing in the serving data. Without environment specified, it will show up as an anomaly. To fix this, we need to set the default environment for all features to be both 'TRAINING' and 'SERVING', and exclude the 'tips' feature from SERVING environment. # All features are by default in both TRAINING and SERVING environments. # Specify that 'tips' feature is not in SERVING environment. # inferred a schema from it. # of L-infinity norm for triggering skew anomaly to be 0.01. If the anomaly truly indicates a skew between training and serving data, then further investigation is necessary as this could have a direct impact on model performance. The example notebook contains a simple visualization of the skew anomalies as a table, listing the features where skews are detected and a short description of each skew. # day 2, and inferred a schema from it. # of L-infinity norm for triggering drift anomaly to be 0.01. To compute data statistics, TFDV provides several convenient methods for handling input data in various formats (e.g. TFRecord of tf.train.Example, CSV, etc). If your data format is not in this list, you need to write a custom data connector for reading input data, and connect it with the TFDV core API for computing data statistics. Then the input to tfdv.GenerateStatistics PTransform should be a PCollection of dictionaries. Once you have implemented the custom data connector that transforms your input example into a dictionary, you need to connect it with the tfdv.GenerateStatistics API for computing the data statistics. Take TFRecord of tf.train.Example's for example. We provide the TFExampleDecoder data connector, and below is an example of how to connect it with the tfdv.GenerateStatistics API. # 1. Read out the examples from input files. # 2. Convert each example to a dict of feature name to numpy array of feature values. # 3. Invoke TFDV `GenerateStatistics` API to compute the data statistics. # 4. Materialize the generated data statistics.